UH President and System Chancellor Dr. Renu Khator fields questions during a recent exchange with University of Houston Law Center students. 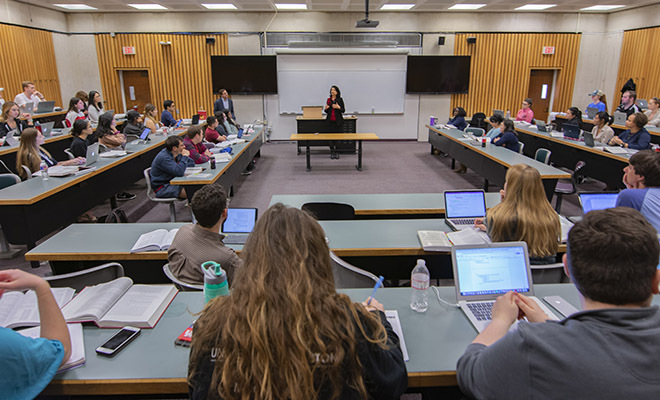 Feb. 5, 2019 - UH President and System Chancellor Dr. Renu Khator answered inquiries from University of Houston Law Center students during a visit to Professor Douglas Moll's Secured Financing class on Monday. Khator makes visits to graduate school classrooms regularly to interact with students. "I have eight vice presidents and I am always asking them what we are doing for students," Khator said. I always get reports back, but there's no substitute for directly interacting with students and understanding what's going on. "I want to hear from you about what's working or what's not working. If you were to give me my charge as chancellor for the next three years, what would you tell me to focus on? This is how I've been able to do a few things that I haven't thought of in the last 11 years that I've been here." Students voiced their concerns on parking, mental health issues among law students, food options, campus safety and flooding challenges at the Law Center. Khator noted the necessity for a new building for the Law Center. "This is a great law school when you look at the product and the rankings, but look at the facilities. The Law Center is a jewel, and is ranked so high because of people who go the extra mile. "A new building for the Law Center is the No. 1 request from the legislature and we're working day and night for it. Alums have also raised money and are still raising money. This building is going to get built one way or another."